Indigo Pop, actually....I kind of like paisley meets plaid too. I love all six, but I have to have Provincial and Paisley Meets Plaid. Indigo Pop and Portobello Road may also have to be new additions too! I'd like to know why 6 patterns. It seems like overkill to me. 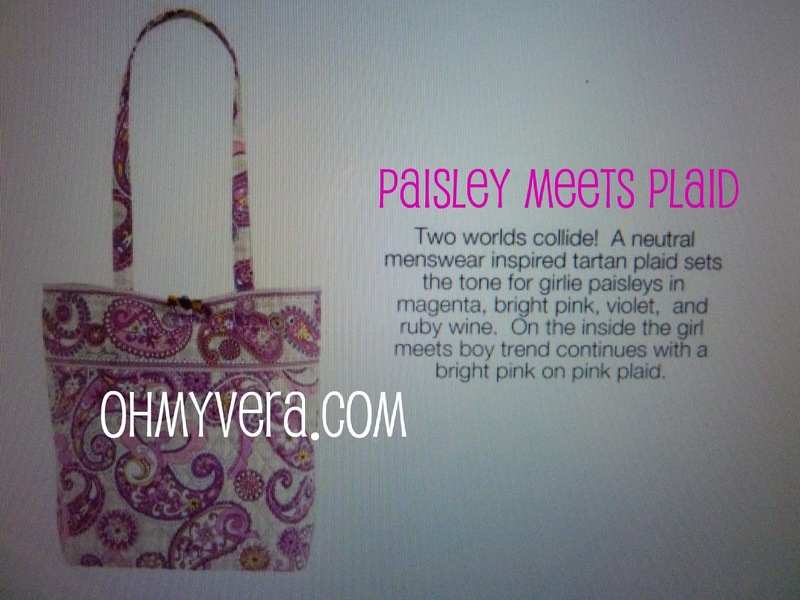 OMG, I have to have Paisley Meets Plaid! Between Rosy Posies, Limes Up, Summer Cottage and Paisley Meets Plaid, it looks like 2012 will be another Vera-filled year for me. I'll have to check out Portobello Road, Va Va Bloom, and Indigo Pop in person (although I probably shouldn't, for budgetary reasons. lol). I like that Vera Bradley is offering a brown pattern, but I'm not crazy about the "bandana inspired" look. Thanks for posting, Alison! I did not dig any pattern in spring 2012. Summer 2012 was great and I can not wait for Fall and Winter 2012.
by far the Paisley Meets Plaid is the best and my very favorite!!! I love Provincial and Indigo Pop! 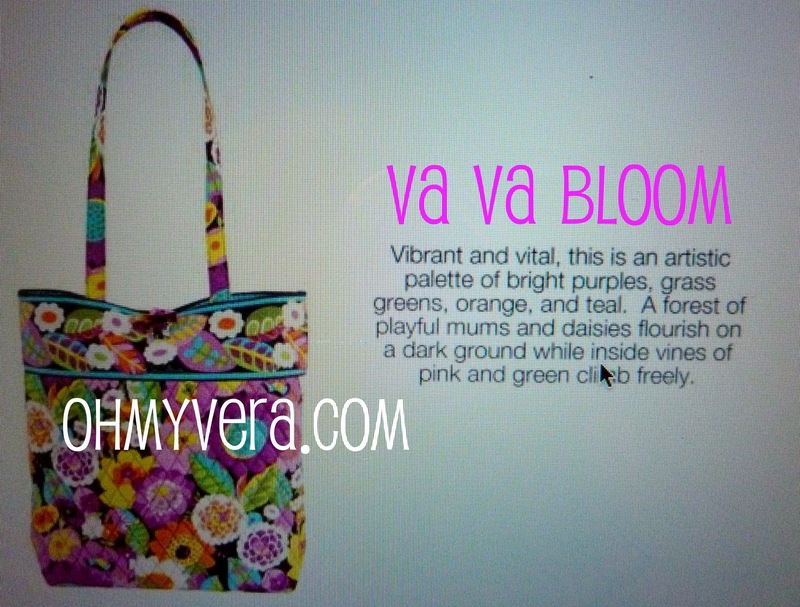 I am liking that Vera Bradley is coming out with 6 patterns instead of four, and I hope lots more styles!! I wish Vera would do at least one pattern that is more subtle, like the patterns of old. All of the recent patterns have too many bright colors and patterns that are too bold. We need beautiful colors, but fewer, with smaller, less busy patterns! I think I like Indigo Pop the best. I really wish they'd stop making paisley patterns as I really really hate paisley. i love them all, but i'm definitely going to try to get something in indigo pop, va va bloom, provincial, and portabello road. those are my favorites. Again, they are okay. Still not loving any of the winter, spring, summer, and now fall patterns! Stop retiring the good old patterns, Vera Bradley! va va voom, paisley plaid, indigo pop. save up for fall !! I wish they would make some smaller patterns. Everything is just bold. 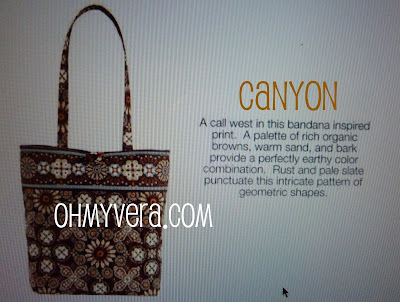 Canyon: Not for me, but nice to have a brown pattern for folks who miss Caffe Latte and Medallion. Would be nice if it was a little more geometric and not as flowery. Indigo Pop: I love blue, and love the "stained glass" look of this pattern! I don't recall seeing a bright blue background before on a VB bag, so this is very different. Colorful without being tremendously loud. I will definitely get something in this color. Paisley Plaid: I like the concept, and have been waiting for a plaid pattern ever since I missed the multi-wool plaid items from a few years back (sob), but maybe I need a new monitor. I can't see the plaid pattern here. If you can actually see the plaid pattern background, I think this could be nice. Wish it were slightly less girly. How about just a plaid pattern for one of these seasons, Vera? Portobello Road: Ugh. Drab, boring. This looks like it was made from remnant fabric. If you want a grey background VB, buy something in Tea Garden. Provincial: Why is this labeled "New"? At any rate, it's been a while since there has been yellow or orange patterns, so I'm liking this one as well. The turquoise accents work really well, gives it a southwest flavor and reminds me of the Paprika inside pattern. VaVaBloom: Okay the name is adorable, but the pattern ... eh. I guess there have been enough loud busy patterns recently that I'm not feeling it for this one. Looks almost like a fake VB. I have a Va Va Bloom's Small Cosmetic and I can see where you are coming from with the "Almost Fake" statement. Portobello Road is very drab I agree. I am not a fan of orange\ yellow backgrounds so Provincial is an no go for me. I do like orange though orange and pink together is pretty(folkloric was beautiful). 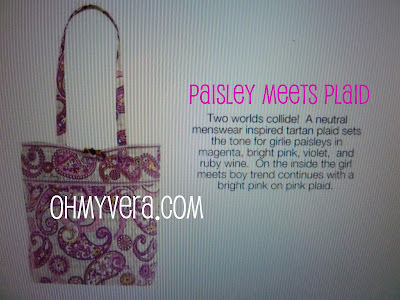 Paisley Meets Plaid has the plaid pattern on the inside and the paisley is on the outside I CAN NOT WAIT TO OWN IT(I love PINK). Indigo Pop is very bright. Canyon reminds me of Kensington and Caffe Latte and Medallion. I do not like Brown. 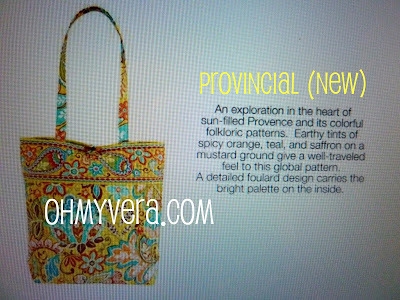 Provincial is labeled as "new" because they are reusing the name. i actually like all of these! will have to see them in person of course, but right now paisley meets plaid, provincial, and va va bloom are looking promising. i'm excited for fall 2012 since i'm not partial to any of the spring or summer 2012 patterns. Kind of hard to tell from the pic, but I think canyon is my favorite. 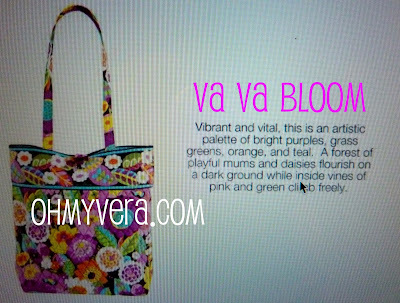 wow-- va va bloom is GORGEOUS!!!! Love the paisley meets plaid!! One word- WOW! This is the best pattern set ever! I don't really like canyon but the rest is amazing! I usally don't like patterns with a black background, but I have to say, va va bloom is pretty adorable! My favorite is Indigo pop, but paisley meets plaid is a pretty close second! Thanks Vera, this is much better than spring and summer 2012! The other too are just tooo gaudy! I really like indigo pop and paisley meets plaid. I am really excited for this set to come out. i love them all!!! im excited fro them i will get these patterns fro my b day:)) when do they come out..?? Vera Bradley Facebook says June 30 and July 10. I really like the Va Va Bloom pattern. It is so colorful. I really hope they pick this one. 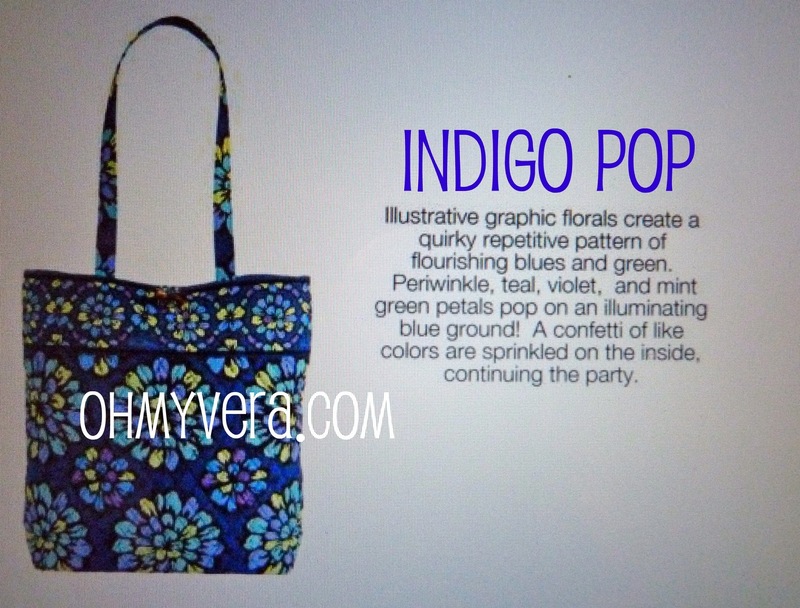 Indigo Pop is going to be my first must have! Gorgeous! I like indigo pop, portabello road, provincial, and vava bloom. So bright, pretty and cheerful!! :) The other 2 look like knock off veras, in my opinion. 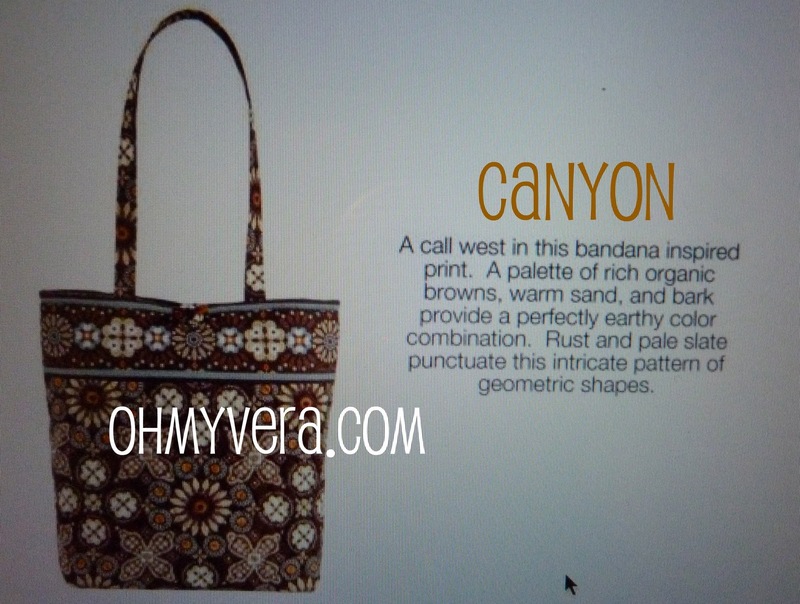 I LOVE Indigo Pop and Canyon! They are beautiful. 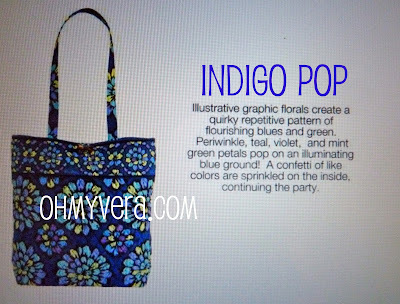 Indigo Pop looks like something I would carry in the summer though! But they are still on my must have list! Indigo pop definitely! I just saw their new Spring 2012 patterns and I know Vera Bradley can do way better than that. But I'd have to say Camellia or however you spell it is my favorite. But I think that the Fall 2011 colors (Mocha Rouge, Happy Snails, Plum Petals, and Safari Sunset) is their best collection yet! my favorites! in order would have to be Indigo pop! close second Portobello Road! and paisley meets plaid!, Va Va Bloom!, and Provincial! are a tie!! and then sorry but canyon! last:( but i have to say... i LOVE all of them!! good job Vera!! Ahh! I'm loving Provincial (New) and Canyon they both remind me of the 70s and the south! I also like Va Va Bloom. 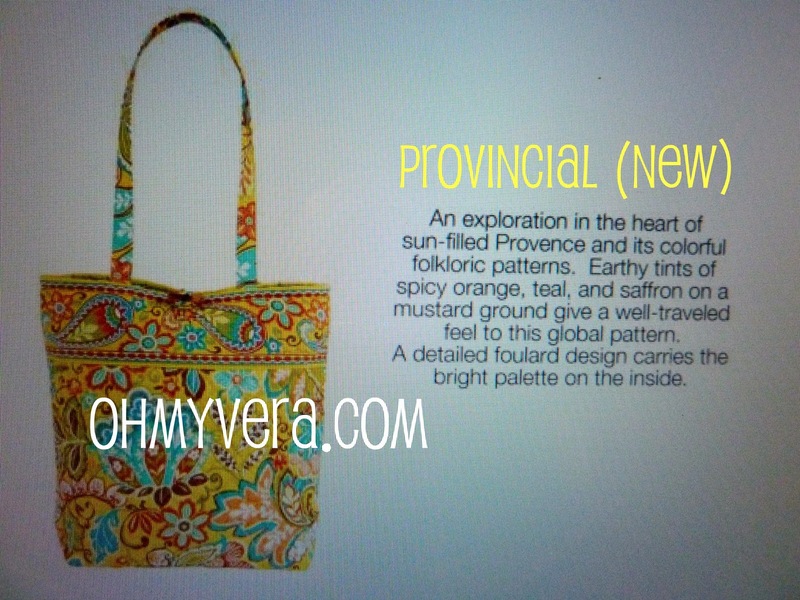 I can't wait to buy the Provincial (New) hipster bag if that is the fall 2012 color choice that is picked! OMG..Va Va Bloom and Provincial are absolutely gorgeous! I want them!! OMG!!!!! i LOVE indigo pop!!!!! i hope they choose to make that one!! Canyon all the way!! There are not ever any really pretty brown patterns and I think this one is awesome! Can use it all year too! 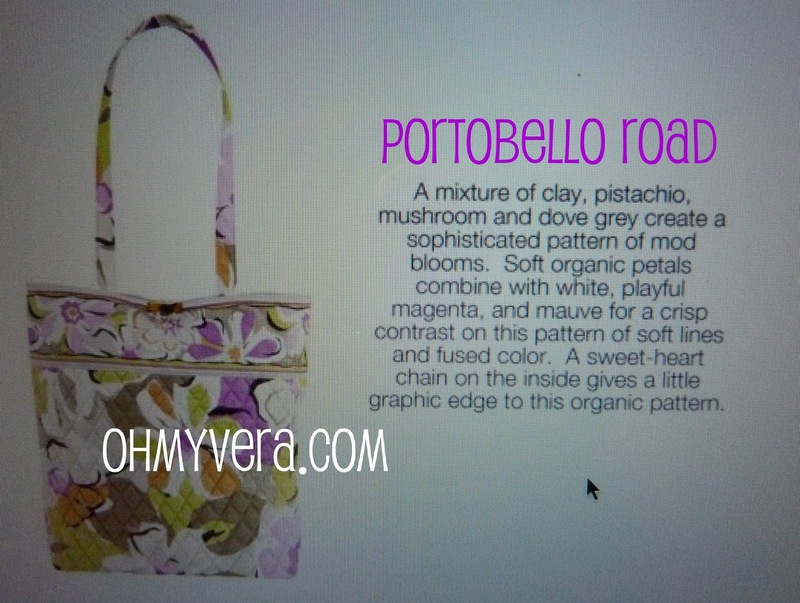 I also like the portobello road ....it is cute too..Blah on va va bloom and provincial they are too overwhelming for a bag. I'm traveling with my Mom from Chicago to Vegas for A Colorful Day.... hoping to snag some new goodies!! I can't keep up with all the new stuff on my teachers salary! I would like a good wheeled horizontal bag (I missed out on the last one) for my computer and school stuff. I've been walking to work and my shoulders get tired of carrying all my stufF! They're all pretty, but they don't llook at all like winter colors. Indigo pop, Provincial and Va Va Bloom are my favorites. Wow. Lots of color. The only one that interests me from the photo perspective is the indgo pop. I have 30 of them! I got the the IPhone cover in paisley meets plaid & I love it. I didn't know at the time I bought it, that it was a new fall color. Wow, I actually like 2 of the colors a lot, I must say I am impressed because I haven't like there patterns for over a year now. I love the Indigo Pop & Provincial! Very Happy! :) Thanks for sharing! Just went to the VB store this week and I am shocked at what I liked! So from this survey I really liked indigo pop and paisley meets plaid. 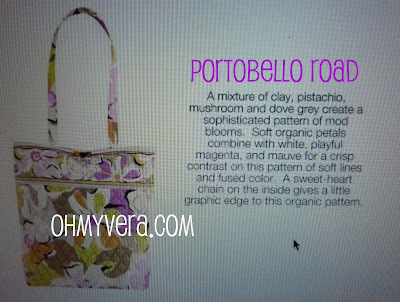 I was neutral on the portobello road, provencal, and va va bloom. I was a no on the canyon. After seeing the patterns in person my favorite was actually canyon and I am not a brown person at all. I bought several items in it. My next favorite was provencal and I don't really like yellow either so I was shocked that I liked this. I just thought the pattern was so beautiful! Also I like how you can kind of mix provencal and canyon because they have a southwestern feel to them and the colors just go well together. Another thing I liked about these patterns were they weren't very typical of something say a six year old would carry, which sometimes I feel like certain patterns can seem very elementary. I almost got something in portobello road but it was too similar to watercolors for me. I decided that paisley meets plaid, and vava bloom were kind of juvenile looking and surprisingly I didn't like indigo pop as much in person even though I am a huge blue person.